I primarily read titles in three very distinct, yet separate genres: alternate history, post-apocalyptic disaster (primarily zombie-related), and Cthulhu/Lovecraftian Mythos. About the only thing that joins all three genres together, for me as a reader, is their almost-obsessive focus on the 19th and 20th Centuries to the exclusion what practically every other period in human history. There are s few books in all three genres that decides to locate their tales in the more distant epochs of human history, or indeed in locations that aren’t North America or parts of Western Europe. Now to an extent that’s understandable, because I suspect that’s where the majority of the audience for those genres lives, and as such authors, and publishers, are going to focus on those markets. And the same applies chronologically – modern-day tales, or those set in periods that the audience is most familiar with (which roughly appears to be the advent of the American Civil War through to the early 21st Century, and occasionally beyond) are likely to be the most successful. However I feel that this is a rather myopic view to take, as all this achieves is to leave thousands of years of human history, and countless countries, nation-states and locations, gathering dust figuratively speaking. This particular review will focus on the first of the two Cthulhu Invictus anthologies, Tales of Cthulhu Invictus, published in 2015. The first thing that strikes me with the anthology is the amazing illustration that forms the basis of the cover art. Drawn by artist Alberto Guerra, it depicts Cthulhu emerging from the waves as a Roman Trireme frantically tries to escape in the foreground, and is both fantastically atmospheric and entirely thematic to the contents of the anthology – the might of the Roman Empire, brought low by the power, influence and machinations of the Cthulhu Mythos despite its best efforts. The collection is edited by Brian M. Sammons – a sure sign that an anthology is worth your time as a reader – and consists of nine short stories penned by some of the best writers in the Mythos genre – William Meikle, Christine Morgan, Edward M. Erdelac and others. It begins strongly with Vulcan’s Forge from William Meikle, who gives us a tale of the real reason why the city of Pompeii was devastated by a volcano that killed so many and wiped out the entire area; it’s a simple, atmospheric tale of the foolhardy nature of humanity, and the arrogance of the Roman Empire in assuming that it can exert its control over something not of this world, and is an excellent way to open with. We then come to Fecunditati Augustae by Christine Morgan, which is a tense and emotionally gut-wrenching tale of the price a mother would pay for the survival of her children, turning to emissaries of darker gods when the usual Roman deities fail to deliver what she wants. For me it’s by far the best tale in the collection, as it delivers a great dose of existential horror while also very effectively merging the reality of Roman life and god-worship with the fictional Mythos and its gods. Moving through the collection, Pete Rawlik delivers Time Devours All, a fantastic short story that delves into the mysticism, augury and divination that existed in Roman times, even without the addition of Lovecraftian horrors. The tale focuses on the mysterious occult group known as the Decemviri, an ancient order who controlled the Sibylline books, mystical texts that the group consulted with during momentous crises through the history of Rome in order to try and control events. Rawlik does an excellent job in drawing out the arrogance and egotism that existed in the Decemviri, highlighting all of the internal machinations and political struggles, and the manner in which these men have perverted the entire course of the Republic and Empire to their own ends. But as the tale goes on, we see how a mysterious, ancient stranger that the group relied upon for these prophecies has actually had his own agenda, one that threatens to destroy everything they held dear, and the ending has a strong sense of fatalism that is very reminiscent of Lovecraft’s classic tales. Edward M. Erdelac then produces The Unrepeatables, which is a fast-paced, occult detective-style story in which a merchantman and his bodyguard are blackmailed into investigating a famous charioteer; although initially their only goal is to try and gather evidence of the athlete’s dubious religious practices, in order to discredit him, the two men rapidly find themselves battling a cult that threatens to destroy all of Rome. This is a great adventure, with some enjoyable protagonists in Modius Macula and Damis of Nineveh and some intriguing insights into how Lovecraftian horrors could infiltrate Roman society, as well as a sobering reminder that Rome’s treatment of its enemies could very easily lead to a backlash from those with nothing left to lose, and I’d love to see more from the duo in future stories. Magnum Innominandum by Penelope Love is another great story, in which an upper-class Roman widow turns detective to try and trace the cause of death of one of her social group, only to discover yet another cult. Love has some interesting things to say about the confusing and intertwined social hierarchies in Roman society, and the manner in which slaves and lower classes would use any power at their disposal (occult, in this case) to have their revenge if wronged; and she has also produced an excellent investigative story with a strong and memorable female protagonist that is reminiscent of the Marcus Didius Falco novels by Lindsey Davis. Coming to the end of the anthology, Lines In The Sand by Tom Lynch is a classic, straight-up Lovecraftian horror that brings the King in Yellow and Carcosa to the dusty edges of the Roman Empire that has an enjoyable, mind-bending finale, and The Temple of Iald-T’Quthoth from Lee Clarke Zumpe is a rip-roaring romp that follows the Roman authorities in trying to crack down on a cult, only to find that the conspiracy concealing the group and its members goes all the way to the top, resulting in a gory and blood (and brain) splattered ending that doesn’t bode well for the long-term future of the Empire. And finally, The Seven Thunders by Robert M. Price is a strong story to end the anthology on, as two sages – mentor and apprentice – race around the outskirts of the Empire to try and stop a crazed Emperor from enacting a prophecy that could quite literally end the world. There’s some great world-building throughout the story, and there’s a twist to the ending that had me re-reading the story to see just how the author had pulled it off. 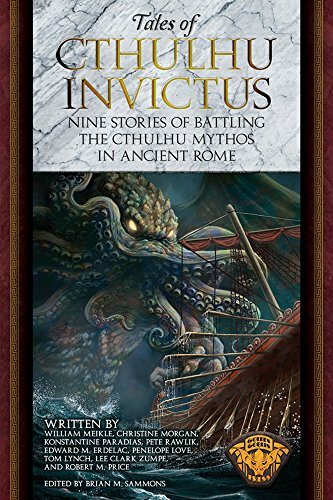 With some excellent cover art, high-quality editing, and some brilliant stories that delve into the world of Cthulhu Invictus to deliver nine original and vivid stories that cleverly merge together historical Rome and fictional Lovecraftian horrors, Tales of Cthulhu Invictus is an invaluable anthology that goes quite some way to filling in some major holes in the Lovecraftian/Cthulhu Mythos genre, and deserves to be read by anyone with an interest in the genre, or just good writing in general.